The courgettes, otherwise known as zucchini, continue to flourish in the way only courgettes know how to. Having enjoyed the spiced courgette fritters I made recently and with plenty more courgettes developing, I couldn’t resist this chickpea pancake version when I spotted it in the February 2005 issue of Delicious. These made a substantial one pancake meal and yet retained an appealing lightness making them ideal summer fare. Gluten free fans, please note, there’s no wheat in these and the chickpea flour, also known as gram flour, is more than a mere substitute. Chickpea pancakes, otherwise known as socca are a common street food in the south of France. This is my version and it scored well. 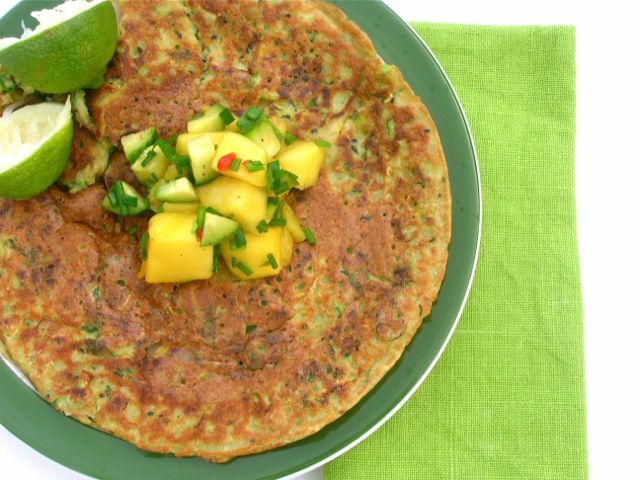 The mango salsa enlivened the pancakes with a hot and fruity kick – goal! A substantial wholesome pancake enlivened with spices and served with a tangy salsa and yoghurt. Made with chickpea flour, it is naturally gluten free. Grate the courgettes and leave in a colander or sieve to drain of some of the liquid, for 30 minutes or so. Prepare and mix all the salsa ingredients together and season with salt if desired. Place the chickpea flour, bicarbonate of soda, spices, salt and pepper into a large bowl and whisk to mix. Make a well in the centre and add the egg. Start to whisk this in gradually adding the water until all is incorporated. Stir in the courgettes, onions, chilli, parsley and oil. Heat a 20 cm non-stick frying pan over a moderate heat and grease with a little oil. Spoon a quarter of the mixture into the pan and flatten out into a large pancake. Fry for about 3-4 minutes until set then flip over and fry for a further 2-3 minutes. Keep warm in a low oven and repeat the process three more times. Serve with the mango salsa and yoghurt. I’m sending this off to Jac at Tinned Tomatoes for Meat Free Mondays. If you omit the egg, this would be vegan too. Stuffed full of courgettes as these pancakes are, I’m sending them off to Extra Veg which is this month being hosted at Feeding Boys & a Firefighter on behalf of Fuss Free Flavours and Utterly Scrummy. This looks fab – I love using chickpea flour, gives dishes such an interesting taste and texture! I’ve used chickpea flour in cakes before which works well, but as a pancake, this was a first for me – it won’t be a last. I had no idea that chickpea pancakes were served in the south of France! You learn something new everyday don’t you! These look delicious. I’ll be sure to post a photo when I give them a try. My parents veg patch is also over flowing with cougette so I’ll be sure to make these when they deliver the next harvest! 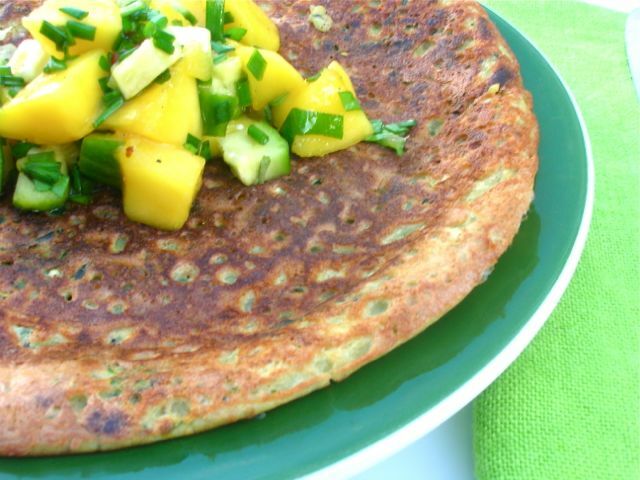 Love these natural gluten free pancakes and that mango salsa looks terrific too. thanks Angie. Chickpea flour works so well in pancakes, I’m just surprised it’s taken me so long to find out. These pancakes are so delicious and inviting.. They are made to perfection. I would relish them with some spicy pickle. Thanks Shobha. The mango chutney worked well, but you’re right any sort of spicy pickle would be good. Can I come over for lunch? Please! Please! I love chickpea pancakes they’re so light and fluffy! Yours look super delicious with vibrant mango on top! Of course Sylvia 😉 Why has it taken me so long to discover them I’m now wondering? U know I have to subscribe ur blog dear Choclette…. I am a pure vegetarian girl, and this will be my favorite pancakes… Thanks a ton for sharing!! Thank you Jolly. The pancakes were indeed very good. Yum! That looks fabulous and love the idea of the mango & cucumber chutney. Thanks for linking to my Indian pancakes too! Thanks Kate. The mango and cucumber chutney worked really nicely with soft and sweet, cool and crunchy together with lime sour and chilli heat – a great combination. Awesome Pancakes !! Perfectly made . I would love these with some spicy pickle or chutney anytime. Thanks for sharing. Thank you Preethi, spicy pickle, chutney or salsa really takes these pancakes up to the next level. You and the Viking will love them for sure Dom AND there are so many courgettes right now. Chickpea flour is surprisingly good Sina and makes a nice light and fluffy pancake too. Traditionally they are made with just water, so the egg is sort of superfluous. Chickpea flour waffles could be fantastic Helen if you get it right – good luck. This looks so tasty! I am really into courgettes at the moment. That’s lucky Kacie, there are so many courgettes to be had at the moment. But make the most of them, the season is coming to an end. They sound so delicious! Love this combination and pinning for use ASAP. It really has GG. I was surprised at how light and fluffy these pancakes were – tasty too. Yes, this is a good one for you Kate and the chickpea flour really does make a fantastic pancake. As for the mango salsa … well!!! These pancakes look absolutely fantastic! Hearty and filling and healthy, too! Thanks Katie. Adding them to pancakes or fritters is a lovely way to use them and also good for kids who might be a bit picky about their veg. I like the sound of your chutney, I am a biiiig fan of mangoes and love pancakes too. Working with chickpea flour is also great fun. I’ve been really surprised at how good chickpea flour is in cakes Manjiri as well as pancakes. Haha Sarah, are you inundated with courgettes by any chance? We’ve been making lots of soup, but I’ve done a few pancakes and fritters now and they make a really nice change. I would never have thought to add courgettes to a pancake batter. I love the look of that spicy salsa too. Courgettes work really well in pancakes. I’ve used them in wheat ones too. And yes, this has reminded me how good that chutney was. Rushes off to buy mangos.